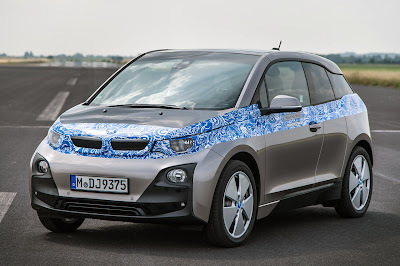 Home » BMW » BMW i3 Pricing Announced. BMW today announced pricing for the ground-breaking BMW i3 electric vehicle. The Manufacturer's Suggested Retail Price (without Destination & Handling) in the US will be $41,350, before any federal or state incentives. The Destination & Handling fee in the US is currently $925. "The BMW i3 heralds the dawn of a new era for individual mobility and for the BMW Group. True to a genuine BMW, the BMW i3 has strong emotional appeal, outstanding product substance and a guarantee of sheer driving pleasure," said Ian Robertson, Member of the Board of Management, Sales and Marketing BMW. "With this leading-edge vehicle and attractive price, we will provide customers with a compelling offer for electromobility." The BMW i3's 170 horsepower and 184 lb-ft of torque hybrid-synchronous electric motor, developed and produced by BMW, is electrified by a 22-kWh lithium-ion battery, good for 80-100 miles of emission-free driving. Designed from the ground up to be an electric car, the BMW i3 uses the Industry's first mass produced carbon fiber reinforced plastic (CFRP) passenger cell mounted on an aluminum chassis. The BMW i3 will offer interior space comparable to the legendary BMW 3 Series on a shorter overall body. Its 32.3-foot turning circle and a relatively long wheelbase make it agile and engaging to drive, yet ideally suited to driving in dense urban areas. Quick and convenient charging is possible either with the home charging station supplied by BMW i or at any public charging station that uses a Level 2 SAE J1772 charging system. DC fast charging, using the SAE DC Combo-Fast Charger, will be available as an option. From a public fast-charging station, it will provide an 80 percent charge from a fully depleted battery in just 20 minutes. BMW i's commitment to sustainable urban mobility encompasses the i3 production facilities, where hydro-electric, wind and solar power are used to power the CFRP production facilities in Moses Lake, Washington and the Leipzig, Germany assembly line. Sustainable materials are also used for the BMW i3 interior upholstery and trim. The BMW i3 will make its world debut at three simultaneous events in New York, London and Beijing on Monday, July 29. It will arrive in US showrooms in the second quarter of 2014.